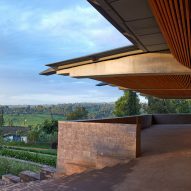 John McAslan + Partners and Triad Architects have built a cathedral on the edge of a tea plantation outside Nairobi, Kenya, featuring a tiled and angled roof lined with wooden slats. Kericho Cathedral is the latest in a string of worship spaces designed by local firm Triad Architects and John McAslan's London-based team, which is also working on Britain's largest mosque. Located around 250 kilometres southwest of the Kenyan capital, in the town of Kericho, it is surrounded by the vast plantations that make the area one of the world's biggest tea producers. The cathedral's most striking feature is its large pitched roof, which is covered in red tiles and lined in ribs of timber. It inclines steeply from the entrance towards the pulpit, where the nave broadens to accommodate a congregation of 1,500 for communion. "The building's palette of materials honours and respects the faith and frugality of this rural African context," said John McAslan + Partners, which completed the church at the end of 2015. "The aspiration was to create a structure that integrated seamlessly with its landscape setting, in both aesthetic and functional terms," added the architects. 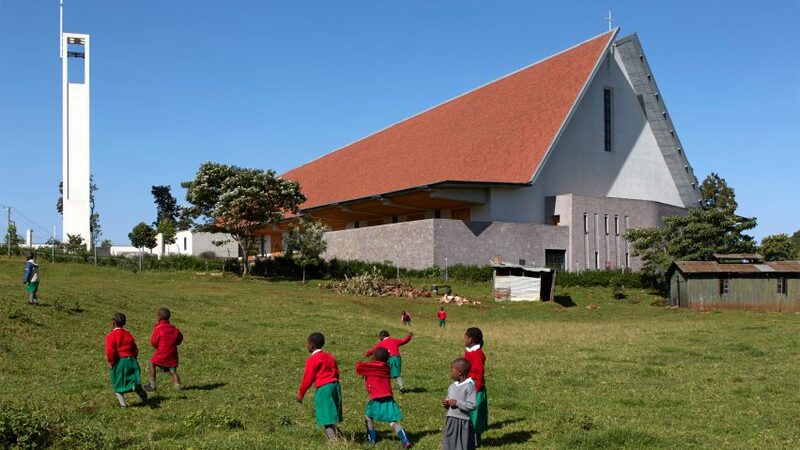 "The cathedral's tiled-roof is now a distinctive form in the rolling panorama of Kericho's hills and valleys." Rows of wooden pews flank the central aisle, which is skylit by a long clerestory window set into the apex of the roof. A further columnar window above a sculpture of christ on the cross provides further natural lighting. Wooden doors along the flanks of the church hall open out to naturally ventilate the space and allow the congregation to flood out onto the gardens surrounding the building. "We believe our response is distinctive and universally welcoming. The ascending vaulted volume contained under a vast roof fuses African and ecclesiastically historic references," said the architects. "Care has been taken to shape the cathedral's space and express the building's structure – the stone plinth, simply articulated, arched concrete frames and timber-ribbed vaulting are exposed in a strikingly crafted and honest manner." Other projects in and around Nairobi include a house with walls of chiselled limestone by Jonathan Woolf Architects and a pavilion designed by Spanish studio SelgasCano that has been repurposed as a school in one of the city's largest slums. Photography is by Edmund Sumner unless otherwise stated.